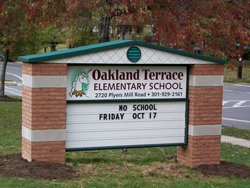 Kerley Signs has extensive experience creating many and varied signs for elementary schools of every profile – both general education and specialized magnet schools. A school is more than an educational facility. 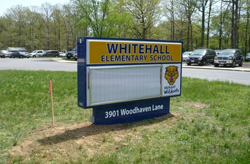 Your elementary school is also a center of many different community activities, which is why it's important to choose an appropriate school sign that will telegraph the distinct personality of the institution and, at the same time, enable the community at large to participate in its life. This is why, in addition to standard static signs, Kerley Signs, Inc. offer a wide variety of both stand-alone and integrated message centers and announcement boards. With our signs, schools can let students know about enrollment and important calendar dates, announce PTA activities, advertise awards and events, recognize outstanding faculty and community members, and much more. Many schools choose to install “letter track” signs – those are the signs, much beloved by churches and retail businesses, that have grooves for changeable letters. This is an excellent and low-cost solution for school announcements and event dates. For a more dynamic presentation, we also build digital LED signs in a variety of sizes, ranging from a single-line marquee to 3x7 foot screens. These useful and versatile signs can serve to show sports scores, make announcements and highlight events in a dynamic and eye-catching way. As part of our commitment to service, Kerley Signs provides installation for our customers in all 50 states. With our nearly 40 years of sign-making experience, we will make sure that all the signs are installed, connected and wired properly, so they will last your institution for decades to come.